You can enhance your legal career with advanced training in a complementary discipline. Recognizing the increasing need for specialization, Miami Law offers a wide range of options offered at the law school itself and in cooperation with the University’s renowned graduate schools. 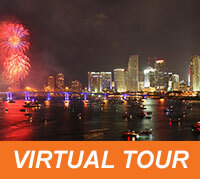 Miami Law additionally offers concentration / areas of focus for students looking to specialize. Joint Degrees in the News: "Alumna at Spotify Rocks Her Joint Music & Entertainment Law Degrees"
*Only for law students who were undergraduate business majors, unique triple degree programs allow three degrees to be obtained in just four years. Is the GRE required for the second program? Must joint degree study first start on the J.D. side? If there is one, what is the application deadline for the second program? Does the second program offer any scholarship possibilities? Is an internship or capstone project required for the second program? Are there any possible J.D. courses, externships, clinics, or other activities that might require special consideration from a course load and scheduling perspective? Are there any additional J.D. course requirements which exist for some of joint degree programs? Students will typically apply to the second program (LL.M.) during their second year of law school, and begin taking courses in the LL.M. program during the fall of their 3L year. Students will typically apply to the second program during their first year of law school, and begin taking courses in the second program as well as in the J.D. program during their second year. Most students participating in a joint degree program will need an extra semester, or perhaps two to complete both degrees. For many programs, it will be possible to complete the J.D. program at the end of the third year allowing students to graduate with their law school cohort. Current Miami Law LL.M. students should submit an application for admission to the J.D. program during the Fall semester of their LL.M. studies and no later than November 1. If you begin a LL.M. program in the Spring semester you must apply for admission to the J.D. program no later than April 1. It is recommended that students discuss their intention to apply to the J.D. program with their LL.M. program director early on in their LL.M. studies to make sure their course selection enables them to complete all graduation requirements effectively. Please refer to the J.D. application overview page for further information. A separate admissions committee will review their application and determine eligibility to enter the J.D. program. The admissions committee takes into consideration the nature of, and grade point average in, classes taken by the applicant while enrolled in the LL.M. program. Contact Lorrie Capps, LL.M. Operations Manager at lcapps@law.miami.edu or at 305-284-4702. Contact Sandy Abraham, Executive Liaison for Interdisciplinary Program and Initiatives at sabraham@law.miami.edu or 305-284-4030. 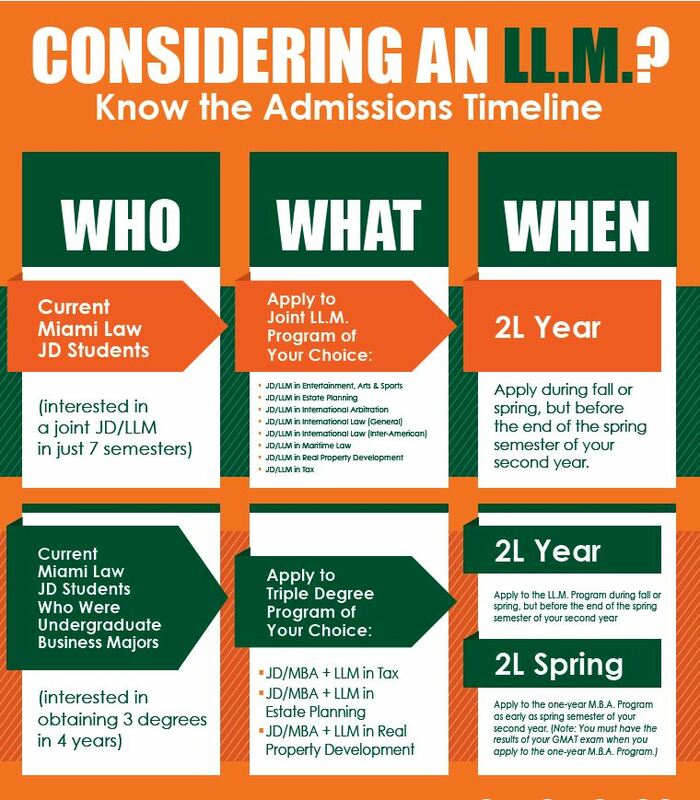 Questions from prospective law students not yet admitted to Miami Law should be addressed to J.D. Admissions.